Well, I made it through the first nine weeks without missing a single day of school due to illness, injury, or catastrophe! Today we had an in-service comp day and I had a TO DO list a mile long. Some things were pressing: Pick up prescriptions, finish progress reports, get groceries. Most of it was those stupid, little things that would only take a minute or two but you put them off…and the list grows longer and longer. And when you do get to those items on the list, you realize you were silly for putting them off. Trying our new call-off system was on the list. It’s all automated now and I kept thinking, I really need to try this before I get sick….. I also needed to schedule a half day off in November for Ian’s next appointment with the endocrinologist. Anyway, I did go in to work for a little while today to take care of a few things. As I was cleaning my desk area I got an idea. I feel like I should add a disclaimer. *If the previous day was a little crazy, all materials can be found within a 5 foot radius of where the map indicates they should be. But I swear, it’s all there! Last year I took a few chapters of our novel, Stargirl, and turned them into a script so my students could do some Reader’s Theater. You can read more about that here. I wanted to do something similar this year for When Zachary Beaver Came to Town, but was feeling a little overwhelmed and just didn’t have the time to make a script. And quite honestly, I think a script is a really big pain to type up. Today it hit me that I could possibly use Excel and type it up in a spreadsheet. 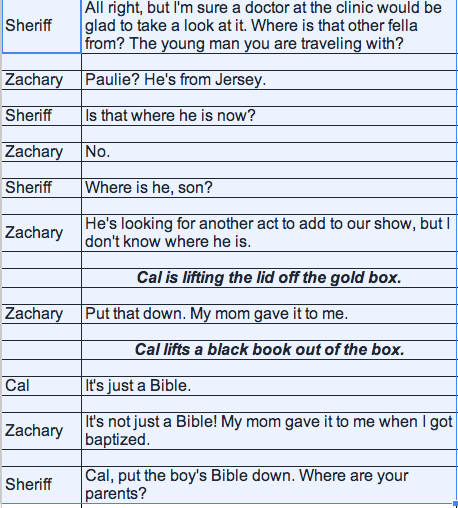 The autofill feature let me enter the names “Sheriff”, “Zachary”, and “Toby” over and over again rather quickly. Typing the dialogue still takes awhile, but the layout is much easier to read. I just ran the copies and think it looks pretty good (and it was definitely easier!) Next time I will change the formatting a little bit, but for the first time I think it’s fine. It took my whole Prep period but it will be worth it tomorrow when they read it! Here’s a peek at what I made. All text is taken from the novel by Kimberly Willis Holt. You know how kids commonly use the “My printer was out of ink” line? I think it’s legit, because it seems like my printer is always out of ink! I am semi-cheap and never use color ink. I also never get to the store to buy black ink until I’m desperate. (Like the kids need something printed). In the middle of August I purchased this poster bundle on Teachers Pay Teachers. These posters are bright and colorful (which lead to this blog about printing). We have a color printer at school but it’s not really for general use. My solution was to email them to Staples and have them printed in color. For 22 full color 8.5 x 11 in. posters on premium white paper, it cost me around $13. 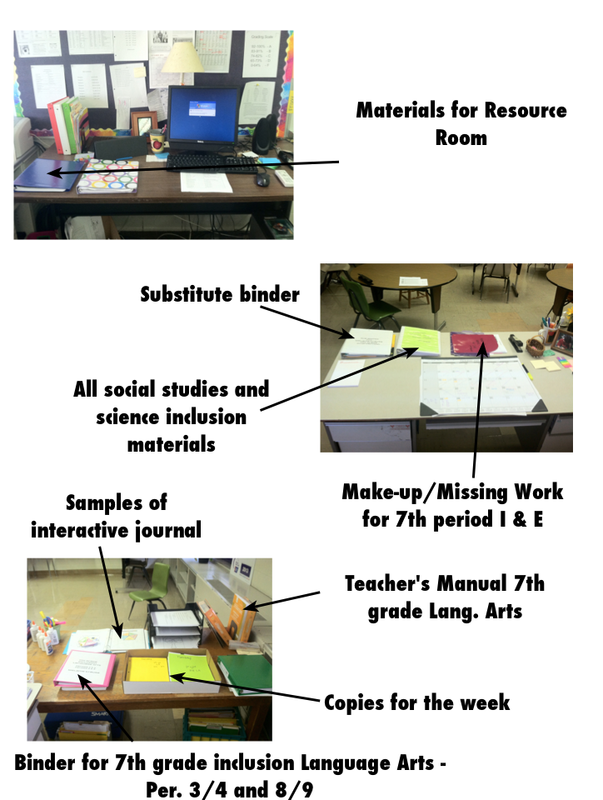 I think I am going to have the PTG laminating lady laminate each set as I get to it in my lesson plans. However, I stumbled upon a pretty neat idea that I may like better. I need to run to Joann’s later (for the third time this weekend) and try it out. Stay tuned…. The first novel we will read, starting in Week 3, will be When Zachary Beaver Came to Town by Kimberly Willis Holt. 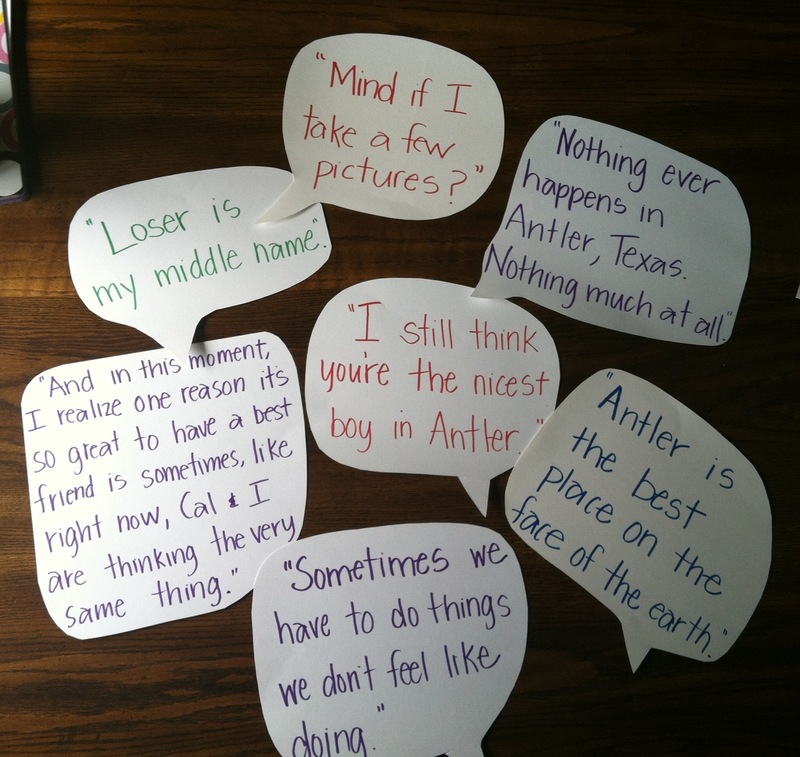 I skimmed the book again this afternoon and decided to make these speech/thought bubbles with quotations from the text. (It’s hard to tell but they are pretty large – I used 12 x 12 cardstock.) I will hang them up around the room before school starts and not say a whole lot about them. (Kids are so observant.) I am hoping it might spark their interest and act as an anticipatory set. I can already see the lightbulbs turning on as we actually read these quotes in the context of the book. 1. Make predictions based on what we have read and one of the selected quotes. 2. Locate the quote in the novel and practice writing responses with citations. 3. Identify the speaker and the situation in which the quotation occurred. 4. Retell and/or explain the portion of the story that each quote is related to. 5. Write any of the above responses in journals (or interactive notebooks) or using the iPads. 6. Draw the scene for each quote on drawing paper and post near the quotes. 7. Act out the scene for each quote. 8. Attach each quote to a large sheet of bulletin board or chart paper before hanging up around the room. Students could write any thoughts or ideas as they come to them. Any other ideas on how you might use quotations from novels? This ReadWriteThink flip book is quick, customizable, and easily made on a copier. All students have to do is cut on the lines. Flip books make excellent study tools and reference materials. I have seen this most often used for vocabulary words or for math formulas/processes. The large white space provides room for drawings and diagrams, as well as text. We recently made a flip book (using the generator at ReadWriteThink) which included important literary terms for our upcoming novel. This served as a review of concepts we’ve already covered and will be a good tool for them as we complete our reading. Awhile back I posted a list of instructional strategies I found online. This lesson-planning menu covers many different types of activities, assessments, and projects. I decided I was going to keep this list in my lesson planning binder and research one every week and try to incorporate it in my class. The first one on the list is the Affinity Diagram. I looked at a few websites and quickly decided how to incorporate this into my lessons. I have posted pictures below with an explanation of how each affinity diagram came to be. I tweaked the process each time and each time, the students surprised me (and themselves) with their understanding. Preparation is simple. You need post-it notes, butcher paper, and a Sharpie. Students were rotating through stations one day. One of these stations required students to look at a pile of nonfiction books on the topic of pirates (which we had been reading about). They were asked to write two new facts down – one per post-it note. They put these post-its on the butcher paper. The next day, as we visited the library, students were invited to go to the paper and move the post-its around on the paper into some sort of grouping. Those were the only directions I gave them. Day 3 – We gathered around our large round table and discussed the groupings and students decided on keywords for the headings. Students received three post-it notes and were asked to write down three things they wanted for Christmas. We gathered around the large round table and shared our wish lists, placing each item on the green butcher paper. They were able to take it a step further and divided those categories into smaller groups yet, as you can see in the photograph. Students received 2-3 post-it notes at random. I had already written the words – which included a variety of holiday/winter related words. I chose the words myself for a few reasons: variety, spelling, and time. After we completed the diagram, students made suggestions for additional words to add to each category. Again, I passed out post-it notes with what they determined to be “Snacks (Junk Food)”. Students supplied some additional ideas for each category as well. I can see this activity being used in many ways with an endless list of topics. I think it demonstrates a student’s ability to understand a topic and make connections. Group discussion and Debate – Groups of students would have the same lists and would have to categorize and then defend their reasons. How would you use an affinity diagram in your classroom? Share your ideas with the comment link at the top of this post. When I am in my car I am always listening to music. And not only am I always singing rather badly, I am listening for examples of figurative language. Yes, I am a nerd. My boyfriend is a nerd, too. We’ve actually had arguments over the use of figurative language in songs. I printed out a PDF of the plot line and passed out the pages randomly. I challenged them to put the events in order correctly. 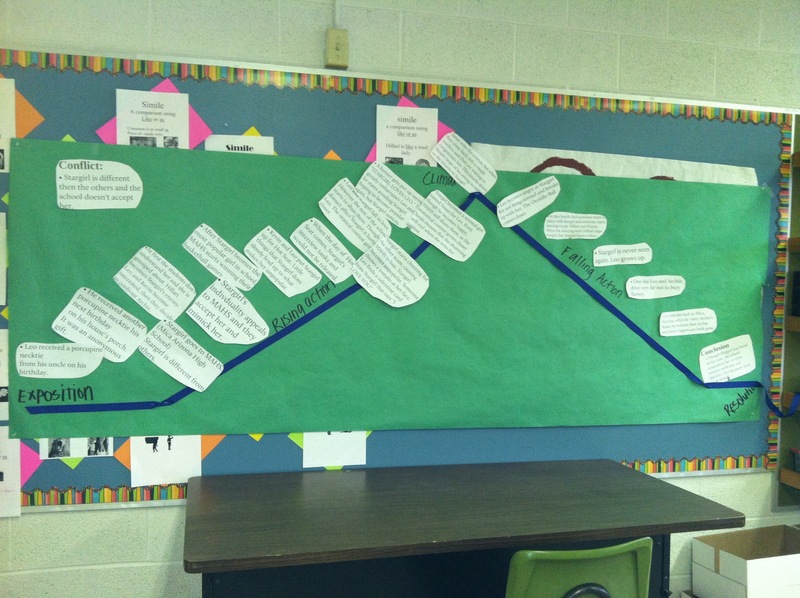 As we sat in front of the bulletin board,which I temporarily covered with a giant plot diagram, we took turns reading and placing the events in the appropriate place. We used push pins so that it was easy to rearrange when we needed to. The final result was pretty impressive and showed me how they understood the story. They loved doing this activity. Big impact. Little preparation. No worksheets. Win-win-win. Instant hands-on activity thanks to Prezi.